The London Metal Exchange (LME) is the futures exchange with the world's largest market in options and futures contracts on base and other metals. As the LME offers contracts with daily expiry dates of up to three months from trade date, weekly contracts to six months, and monthly contracts up to 123 months, it also allows for cash trading. It offers hedging, worldwide reference pricing, and the option of physical delivery to settle contracts. In July 2012, LME's shareholders voted to sell the exchange to Hong Kong Exchanges and Clearing for £1.4 billion. 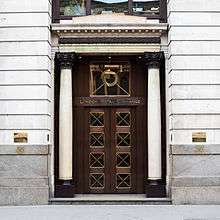 It is located at 10 Finsbury Square in the London Borough of Islington, just to the north of the City of London. The London Metal Market and Exchange Company was founded in 1877, but the market traces its origins back to 1571 and the opening of the Royal Exchange, London. Before the exchange was created, business was conducted by traders in London coffee houses using a makeshift ring drawn in chalk on the floor. At first only copper was traded. Lead and zinc were soon added but only gained official trading status in 1920. The exchange was closed during World War II and did not re-open until 1954. The range of metals traded was extended to include aluminium (1978), nickel (1979), tin (1989), aluminium alloy (1992), steel (2008), and minor metals cobalt and molybdenum (2010). The exchange ceased trading plastics in 2011. The total value of the trade is around $US 11.6 trillion annually. Many deals are made for commodities to be delivered in three months' time. The custom stems from the time that copper cargoes originally took in 1877 on their voyage from the ports of Chile. The LME offers futures and options contracts for aluminium, aluminium alloy, NASAAC (North American Special Aluminium Alloy), cobalt, copper, lead, molybdenum, nickel, steel billet, steel rebar, steel scrap, tin and zinc. To trade contracts in copper, tin, or any other metal listed on the LME, one has to trade through an LME member. Purchasers of contracts, which are then left to reach maturity, will receive a warrant for a specific LME approved warehouse to take delivery of the metal if required. The LME issues, each day, detailed figures on how many tonnes of each metal is in its warehouses, which helps producers and consumers make correct business decisions. Open-outcry is the oldest way of trading on the exchange, though nowadays the majority of trades are placed electronically. It is central to the process of price discovery, the way LME official prices are established. Prices are derived from the most liquid periods of trading; the short open-outcry ring trading sessions, and are most representative of industry supply and demand. The official settlement price, on which contracts are settled, is determined by the last offer price before the bell is sounded to mark the end of the official ring. There is constant inter-office trading, a relatively small yet important portion of trading is still done by open-outcry in the Ring. There are a morning and an afternoon trade, where each of the nine metal contracts are traded in two blocks with a five-minute session for each contract (the sessions last from 11.40 until 13.10 and from 14.55 until 16.15, each session includes a 10-minute break). The second trading block in the morning is key to setting the Daily Official Exchange rates. After the official trades of sessions one and two, there are 85 and 45 minutes of "kerb" trading respectively. Trades are in futures, options and TAPOs (traded average-price options, a form of Asian options). Whilst the price discovery mechanism used by the exchange is post-trade transparent it is not pre-trade transparent. Pre-trade transparency is required for many securities under the Market in Financial Instruments Directive (MiFiD) to achieve fair markets by reducing such illegal abuse as market manipulation. The LME is the last exchange in Europe where open-outcry trading takes place. Ring Dealing Members are entitled to trade in the Ring during the ring-trading sessions. They may also operate a 24-hour market by trading inter-office. All Ring Dealing Members, as members of the LME Clear, are authorised under the Financial Services and Markets Act 2000, and are regulated by the Financial Conduct Authority. Each metal is traded in its own five-minute period. There are two sessions every trading day for each metal. In addition to the 9 companies who have exclusive rights to trade in the Ring, around 100 companies are involved in the LME in total. Contrary to popular belief, the precious metals, gold and silver, are not traded on the London Metal Exchange, but on the over-the-counter market usually referred to as the London Bullion Market, by the members of the London Bullion Market Association. Platinum and palladium are traded on the London Platinum and Palladium Market. Both members of the LBMA and LPPM trade the precious metals spot market on EBS (Electronic Broking Systems)—acquired by ICAP in June 2006. Many companies involved in minor metals are members of the Minor Metal Trade Association. The LME used, however, to provide trade matching and clearing services to the London bullion market and distributes gold, silver, and gold IRS (interest rate swaps) forward rates on behalf of the LBMA. The LME launched an electronic platform called LME Select launched in February 2001. This was developed by a Swedish software house called Cinnober. The platform is a FIX-based trading platform, and now handles a majority of the total LME business. As a market of “last resort”, industry can use the LME’s delivery option to sell excess stock in times of oversupply and as a source of material in times of extreme shortage. In reality, physical delivery occurs in a very small percentage of cases on the LME as most organizations use the LME for hedging purposes. The small percentage which does result in delivery, however, plays a vital role in creating price convergence. To support this mechanism, the LME approves and licenses a network of warehouses and storage facilities around the world. Controversy arose in 2013 because the LME took action to limit the use of its warehouses for the hoarding of aluminum. In March 2014, England's High Court found for Rusal, the huge Russian aluminum company, striking down these rules. ↑ "Futures Contract Specifications". London Metal Exchange. Retrieved 7 August 2015. ↑ "London Metal Exchange: Offices". www.lme.com. Retrieved 28 January 2016. 1 2 3 BBC Radio 4 Today, broadcast 25 October 2011. ↑ Northedge, Richard (2007). "130 years of the LME" (PDF). LME 130th Anniversary Supplement. Newsdesk Communications. Archived from the original (PDF) on 31 October 2014. Retrieved 31 October 2014. ↑ "LME achieves another year of record volume". London Metal Exchange. 5 January 2009. Retrieved 29 July 2009. ↑ "LME Select". London Metal Exchange. Retrieved 7 August 2015. ↑ "Category 1 – Ring Dealing". London Metal Exchange. Retrieved 29 July 2009. ↑ "Ring Dealing Members". London Metal Exchange. Retrieved 7 August 2015.